Since the time CLAT was founded in 2008 the five-year law course has more or less replaced the conventional three year LLB but Delhi University has emerged as the sole name which keeps three year LLB courses alive in India. 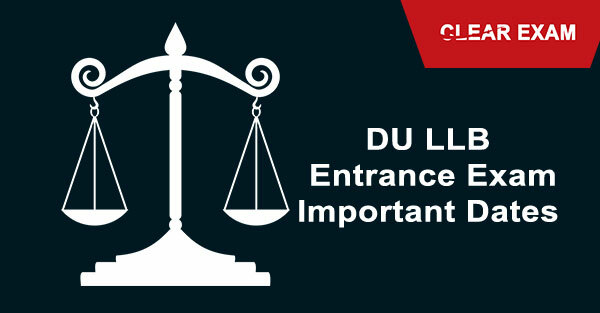 The DU LLB three year law course is a reputed course for all those who are not sure of the career path they will choose to post their education and for those who want many career paths open for themselves in the future. So the question we are going to answer is how does one prepare for the DU LLB Entrance Exam 2018. The DU LLB Exam Syllabus is such that there are a total of 175 questions carrying a weight of 4 marks each. The maximum marks for the DU LLB Entrance Exam 2018 are 700. Let us now look at each section of the paper. In this section, I have compiled Important books for DU LLB Entrance Exam. The first section is English and comprehension. The focus areas are vocabulary, grammar and sentence correction, and reading comprehension. In order to build vocabulary, I suggest you straight away pick up the dictionary and read the meanings of twenty words daily. Read an English newspaper too. This will help with your GK preparation as well. If you want to improve your grammar then go for the book called Wren and Martin and read the relevant sections. For example, if you want to learn about punctuations then read only that chapter. For the most part, this section should be scoring. The GK section is very important because a large number of questions come from this section and for DU.LLB Current Affairs are quite important. Read the newspaper "The Hindu" every day for one year and read each month's issue of the competition success magazine for one whole year. Inculcate the habit of watching a one-hour news show every day where they go over all events of the day. Daily preparation is a much better way to prepare for GK than learning everything at the last moment but if you are not prepared and want a last minute tip then go for a yearbook like Manorama yearbook which will cover the news for one whole year. This section also covers questions from legal GK, for instance, important positions held by people from the legal field for example if a lawyer holds a ministry. You could also be asked about important judgments passed by the SC or HC related to the interpretation of any article of the constitution, or judgments for the safety of women or those related to intellectual property. This was all about legal GK and for legal reasoning,. I suggest the compilation of past year solved papers by A.P. Bhardwaj. Once again I would recommend the book by RS Aggarwal which is more than sufficient to cover this section. For last minute revisions, I suggest the Universal Law Guide. Also, ensure you take a lot of mock tests so as to be able to get an accurate idea about how well you do while keeping in mind the time factor. My conclusion is that with a little preparation this exam is not so much of a tough nut to crack. Get the updated and most relevant Law Entrance study books on upcoming DU LLB entrance Exam 2018 and other Law Entrance Examination Notes etc.